There comes a time when the views on the economy by the various experts become completely divergent and existing techniques to understand the economy's direction no longer make sense. That time is now as we are looking at what some people call a fork in the road toward extremes - a deflationary spiral or a hyperinflation. Getting this right for the Fed will be critical. At stake in the debate: Whether the central bank can steer a course that avoids repeating past policy errors. In 1936, policy makers prolonged the Depression by raising borrowing costs before a recovery was entrenched. In the 1970s, inflation soared when they held off on rate increases. 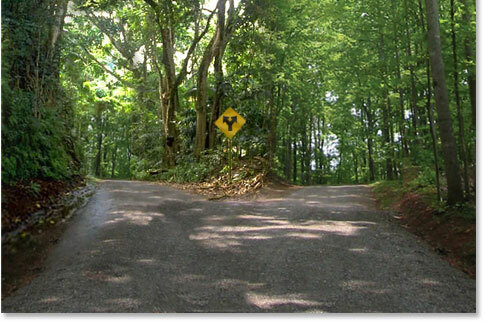 For example when it comes to the Taylor Rule, there is no shortage of diverging views, including Taylor himself. The rule as interpreted by many shows that the current Fed policy is NOT accommodative enough: Fed funds at 0-25 bp is too tight. At the San Francisco Fed, researchers did similar calculations and found the Taylor rule would call for the equivalent of a negative 5 percent funds rate by the end of this year. Jan Hatzius, the chief U.S. economist at Goldman Sachs in New York, is particularly pessimistic. His projections show policy makers should plan for policies equivalent to a fed funds rate of negative 9 percent by December. Negative 9%? Ouch. It's probably time to look for alternative measures to be able to interpret the economic signals. For many market practitioners, one place to look is in the capital markets directly. 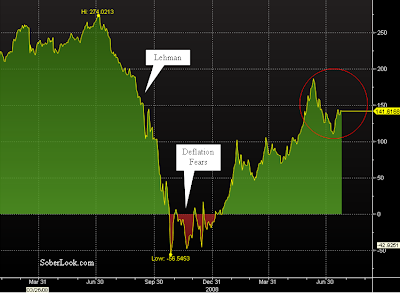 The chart shows how inflation expectations changed form positive to zero or even negative after Lehman collapse, and now back to positive. Now let's define a measure called Market Based Real Rate (MBRR). This is a market practitioner's measure of the real interest rate (vs. nominal rate). Normally one would use the Fed funds effective rate and subtract CPI from it, but CPI tends to be a lagging and infrequently measured indicator. 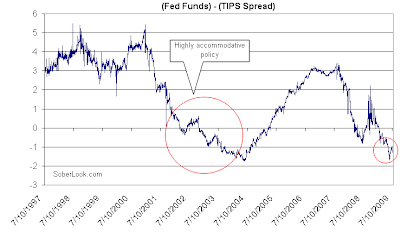 So instead we are subtracting the inflation expectation (IE) that we extract from TIPS yield. MBRR has been at about -1.5%, which based on history seems fairly accommodative. One might argue that it's different this time. Credit is in such poor shape, that even at -1.5% real rate may be restrictive. But remember that this is using the market expectation of inflation, and the market is pricing in some positive inflation. The market already takes into account the expected credit conditions and how they will translate into inflation. So when we compare now to 2002-2003, it's a fair comparison. The market is telling us we are not too restrictive, and in fact we have a very accommodating Fed. Maybe we have more stimulus than we need? So what does this mean for asset levels? Let's compare MBRR to equity levels. 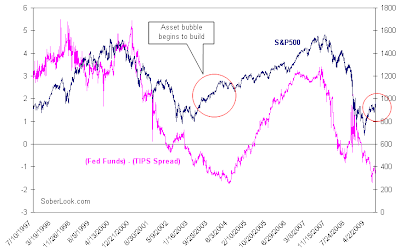 The asset bubble formation started in 2003 as stimulus of 2001-2002 took effect and continued to grow even as the Fed tried to take the stimulus away. The policy was too loose for too long. What the chart above is implying is that we are entering that phase again, and if the Fed doesn't act in a timely manner (see James Bullard's lonely battle), the fork on the road may lead us onto the inflationary path - at least with respect to asset inflation.